This week is Scottish Mental Health Week and this Thursday is World Mental Health Day. The College Library has a lot of items, both historical and modern, on the subject of mental health, and on psychiatry in general. Attitudes towards mental health and mental illness, both from the public and from medical professionals, have clearly changed a lot over the years. However, certain recent events in the media have brought mental health into the spotlight and demonstrated that we have yet to reach a universal understanding of the nature of mental illness. So how much has really changed? Here, we will take a short journey through the history of mental health, looking to the College’s own collections for contemporary examples. Aretaeus the Cappadocian (81-138 AD) was a Greek physician in the first century AD, who followed the Hippocratic theory of humorism and believed that changes in mood between melancholy and mania were brought about by black bile (melan chole) rising up into the stomach and diaphragm. Aretaeus was among the first to make a connection between the two opposing moods, melancholy and mania, hinting at what we would describe today as bipolar disorder. It is a lowness of spirits from a single phantasy, without fever; and it appears to me that melancholy is the commencement and a part of mania. [T]he patients are dull or stern, dejected or unreasonably torpid, without any manifest cause: such is the commencement of melancholy. The College Library holds two English language editions of the extant works of Aretaeus, published in 1785 (Logographic Press) and 1856 (The Sydenham Society). Thus those who imagine that the disease is chiefly an affection of the soul and only secondarily of the body are mistaken. For no philosopher has ever set forth a successful treatment for this disease; moreover, before the mind is affected, the body itself shows visible symptoms. Caelius also argued in favour of an approach to patients suffering from insanity that was remarkably more humane than those of his predecessors. The College library holds two copies of a 1529 printing of Tardarum passionum libri V and a 1709 printing of De morbis acutis & chronicis. Christianity was a powerful force in the middle ages, and people suffering from mental illness in this period were often believed to be possessed by evil spirits. In addition to remedies such as bloodletting and trephining (intended to restore the balance of the humours and purge demons from the body), exorcisms were often carried out. In his encyclopaedia, De Proprietatibis Rerum, the 13th century Franciscan monk Bartholomaeus Anglicus (d. 1272) gives an account of a condition that seems similar to what we would recognise today as depression. Bartholomaeus recognises that mental illnesses can have both physical and psychological causes, and suggests music as a treatment to help keep patients’ minds occupied. The College Library holds an early printed edition of this work. Printed in 1491, it is one of the oldest books in our collection. At the beginning of the modern period, people suffering from mental illness often ended up as victims of the witch-hunts that spread throughout Europe in the 16th and 17th centuries. 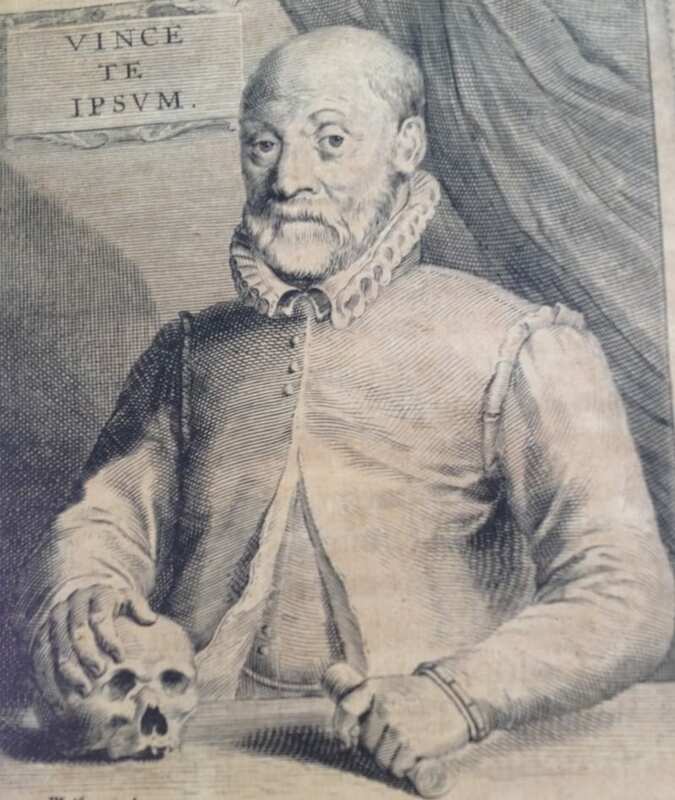 The Dutch physician Johann Weyer (1515-1588) is widely credited with being one of the first to write against the witchcraft delusion, and take a more empirical approach to the study of mental illness. He argued that these so-called witches were in fact mentally ill women, and that they should be given humane medical treatment instead of being tortured. His most famous work on this subject, De Praestigiis Daemonum, was published in 1563. The College Library holds an edition of his complete works, published in Amsterdam in 1660. Robert Burton (1577-1640) was an English scholar, whose Anatomy of Melancholy is perhaps one of the best known books on the subject of depression. Burton suffered from depression himself, and explains in the preface that writing the book helped him to cope with his own personal difficulties, saying “I write of melancholy by being busy to avoid melancholy.” The book, although ostensibly a medical work, tackles a huge range of subjects, and is perhaps better known today for its quality as a work of literature. The book was originally published in 1621, and although Burton published five revised editions in his lifetime, it remained out of print for many years after his death. Interest in his work peaked again in the 19th century, and over 70 editions of The Anatomy of Melancholy have now been published. The College Library holds the 11th edition, published in two volumes in 1806. The Victorian era is infamous for its insane asylums and poor treatment of people with mental health problems. These asylums and “mental hospitals” were touted as places of refuge for people in various vulnerable states, but in reality the treatment was often inhumane and the buildings shockingly similar to prisons in their design and construction. The French physician Philippe Pinel (1745-1826) is hailed today as the father of moral therapy. He argued strongly in favour of the humane treatment of patients in these institutions, did away with the use of chains as restraints, and made significant contributions to the classification of mental disorders. His most famous work is Traité médico-philosophique sur l’aliénation mentale; ou la manie (1801), in which he discusses his humanitarian approach to treatment. The book was translated into English by the British physician D. D. Davis as A Treatise on Insanity (1806). The College Library holds a copy of this first English edition. 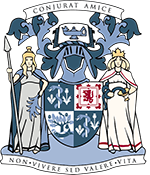 The College Archive is also a good source of contemporary information on mental health treatment and patients. 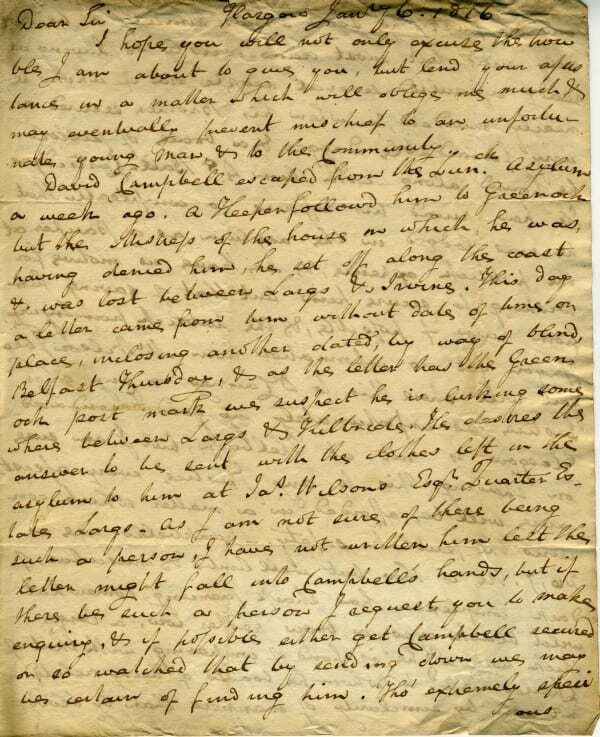 The letter below, for example, was written by Dr Robert Cleghorn to Dr John Campbell in January 1816 regarding a patient who had escaped from the lunatic asylum in Glasgow. Letter regarding David Campbell who escaped from the lunatic asylum. Gives a full description of the patient. It’s comforting to think that we now live in more enlightened times, and that people facing mental health problems are not subjected to witch-hunts, exorcisms, trephining or Victorian lunatic asylums. Nonetheless, there are undoubtedly faults to be found in present-day attitudes towards mental health, and our medical understanding of mental illness is not yet complete. The recent furore surrounding the DSM-5 shows that much discussion and research still lies ahead. The College Library is again an excellent source of information in this regard for students, medical professionals, and the general public. Our resources, such as the Modern Clinical collection, include the most recent and important books and journals on psychiatry, allowing practitioners to stay up to date with the most relevant and useful information. If you are interested in visiting the library to view any of the items featured in this post, or if you have any questions about our collections, please do not hesitate to get in touch. Leave a comment below or email us at library@rcpsg.ac.uk.